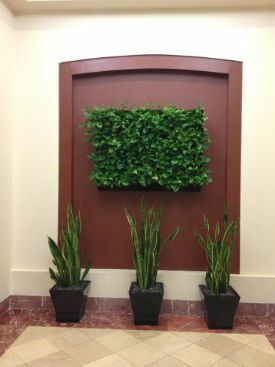 Plant Portraits – Living Art – Atria, Inc.
For many offices, a plant portrait is a much more practical and attainable approach to a green wall. They can be configured on the wall in many different ways and are also available in assorted sizes, so do not count out that smaller wall in your reception area! The photo below is of a recent plant portrait installation by Atria, Inc. in Hartford, CT.
Transform any vertical surface into a lush and strikingly beautiful garden and enjoy all of the benefits of plants – without compromising valuable floor space.